Are there side effects from reading novels? Or from writing one? For the past two years a part of me has been living in seventeenth-century Scotland, and as my plane touches down in Glasgow, I half expect to see a stampede of wild-haired Scots on horseback to a soundtrack of bagpipes. I’ve been writing a novel about Isobel Gowdie, famous seventeenth-century ‘witch’, and I’ve come to Scotland for a bit of mise-en-scène on the Moray coast. As I step off the plane, I’m back in the twenty-first century. The people walking about are indistinguishable from Americans (of course, some of them are Americans), no bagpipes are playing, and I park myself in the ever-present Starbucks to sip cappuccino and wait for James, my Airbnb host, to pick me up. When I’m settled in his comfortable West End flat, I walk along Ashton Lane, visit the Kelvingrove Art Gallery and Museum, and climb up an outdoor staircase to the Wee Curry House where I sit beside a window and look down at the people strolling in the balmy summer evening. Glasgow’s West End is such a stimulating mixture of art and culture, Victorian architecture, bucolic parks, and international restaurants, that soon my jet-lagged spirits are restored. I’m ready to head north, to Inverness and then Nairn, the seaside town on the Moray Firth where my story takes place. Before I started on my Isobel project, I had never considered writing a historical novel. The thought of understanding, much less empathizing with, people from four hundred years ago sounded too daunting. But while researching my Scottish roots, I discovered the story of Isobel Gowdie, and I was hooked. I was a Starhawk (Wiccan) fan in the 1970s and am a Presbyterian minister/psychotherapist. Bitter Magic has now evolved into a first draft. “Was Isobel your ancestor?” a friend asked. But nothing so glamourous for me. My ancestors were on the opposite side of this sorry time in history. They were strict Reformation Protestants — Covenanters — from the Hay clan. Morayshire, where the Hays lived, was the heart of Covenanter country and, not coincidentally, a hotbed of witchcraft trials. Isobel was a peasant on the estate of John Hay, Laird of Park and Lochloy, in Nairn, and her confession, taken over the course of six weeks, stands on record as one of the most extensive and detailed witchcraft confessions of that era. On the train from Glasgow to Inverness I fall into conversation with the woman beside me who works at DASG, the Digital Archive of Scottish Gaelic, a coincidence because Isobel lived in a Scottish Gaelic culture. I tell my seatmate that I tried to learn a little Gaelic before I came and got as far as Is e seo m’ainm, ‘my name is.’ She teaches me madain mhath, ‘good morning.’ But, she says, there aren’t a whole lot of native Gaelic speakers in Morayshire, and as it happens I don’t have a chance to try out my two phrases. Outside the window a crow wheels and lands on a field. Isobel Gowdie claimed that she changed herself into a crow. She saw the fairies and the dead, flew through the sky with the spirits, healed with herbs and charms, but also cursed and harmed people with her magic. Was she a wise woman? A storyteller? A healer? Practitioner of white magic or black? Perhaps she was a shaman. Perhaps psychotic. Perhaps she invented her fantastic confession to placate or entertain her persecutors. Speculation exists on all of these scenarios in the studies on Isobel Gowdie. For the past two years I have struggled with these questions myself while relying on Emma Wilby’s comprehensive research in The Visions of Isobel Gowdie: Magic, Witchcraft and Dark Shamanism in Seventeenth-Century Scotland, and I’ve put the pieces together into a story. So why am I here? What do I want to discover in Scotland that I haven’t already learned from my research and writing? The train passes through a landscape I had only imagined while writing the story of Isobel and the Covenanters: open fields, moors dotted with heather, mountains in the distance, and clouds looming above. But seeing it in person gives me a new perspective. The fields are undulating squares of vivid green and wheat-yellow, the heather blooms in muted purples, and the sky is boundless, like the breath of the universe over the land, expanding my sense of connection and shrinking me to a tiny speck. Just gazing through the train window calms and centers me. Bitter Magic deals with spirituality – Isobel’s, with her earth-based magic, and that of the Covenanters who, in spite of their hard-edged religiosity, were steeped in a kind of passionate mysticism. Being here now brings it home to me: this is a landscape of spirit. In Inverness I rent a car. Apprehensive about driving on the left side of the road, I’m thankful that the traffic is light on the A96 and the day sunny as I head to Nairn. While working on my first draft back in Vermont, I wrote to Andrew Coombs of Lochloy House, one of the people acknowledged in Emma Wilby’s book. To my amazed delight, Andrew not only agreed to speak with me, but offered me the use of his guest cottage while I am here. The original section of the main house, he said, was seventeenth-century and reputed to be Isobel’s home. What a godsend for an author. Now I would really be ‘en-scène’. At Lochloy House (‘Isobel Gowdie of Lochloy’ was her designation) I install myself in the cottage, a peaceful stone bungalow backed by an enormous flower and vegetable garden, and Andrew gives me a tour of the main house, a seventeenth-century stone rectangle with added nineteenth-century wings. As we stand in the driveway looking up at the house, a workman comes out and Andrew says, “She’s looking for the witch.” They laugh when the workman warns me that I’d better watch out or she might fly out of that window. Andrew and I discuss whether Isobel actually lived here, in the original house, as one local legend has it, or in a nearby ‘fermtoun’, a peasant community of wattle and daub huts, as Emma Wilby postulates. We agree on the latter, or at least I do. I walk the path through the forest to Lochloy, now less a lake than a pond with encroaching wetlands, and make a small foray into the surrounding forest. In the 1600s this was all open land. I’m looking for the remains of a settlement that Andrew said was recently discovered and that I think must be the old fermtoun. But I realize that I have no idea where these ruins might be, and the brush and understory are so overgrown that I change my plan and turn back. In the 1600s, before the growth of the present forest, Inshoch Castle would have been visible from here. The castle, home of the Laird and his family, stood at the highest point of the roughly five-mile square encompassing the ancient lands of Park and Lochloy. I am eager to see Inshoch, where much of Bitter Magic takes place and where my other main character, Margaret Hay, daughter of the Laird, lived. Back in the car, I follow the directions and find myself on another one of the ubiquitous one-lane Scottish roads. I stop to inquire of a young woman pushing a pram, and she confirms that the castle is this way, behind a ‘massive, massive house. I find myself on the driveway of this house, not so massive from this angle, and an elderly man greets me. “Are you here to see the castle?” he asks with a glint in his eye. “And will you take photos?” Another smile. “Aye.” He beams with pride and invites me in for tea after I see the castle. Up a slope behind the house, the Inshoch Castle is mostly a pile of stones, but the view is breathtaking, 360 degrees, and for miles in all directions. The Moray Firth, blue and wide on this clear day, lies to the north and the Cairngorms to the south. In the 1600s much of the land between here and the Cairngorms was bog, a natural fortification against invaders. To the north I can even see the lake/pond of Lochloy with its surrounding forest. This is not the castle home I imagined for Margaret. Now that I am here I realize how primitive castle-living was in the 1600s. This building was a keep, a tall rectangle abutted with cylindrical towers, with a small door on the ground floor that could easily be barricaded and tiny slits for windows, just enough to poke a gun through. The Great Hall, not so ‘great’ by our standards, contained most of the living space. I see that I’ve been swayed by some archetypal idea of a castle as elegant and luxurious. I’ll have to do a bit of revising of my manuscript. Tea with James and Doreen Campbell, present landowners of the Inshoch site, is a refreshing break. They shower me with books and information from their library about Inshoch and the Hay family as well as delightful conversation. I want to see the other castles, the places that Margaret went to and that Isobel would have known. 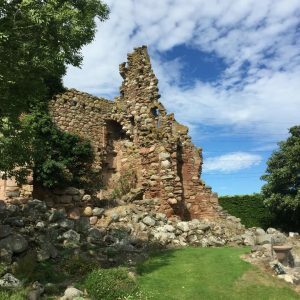 The biggest and most luxurious was Darnaway Castle, home of the Earl of Moray. It was here that Isobel claimed she flew on her night rides with the fairies and her coven, raiding and feasting on the castle stores and dancing the night away. Darnaway is now a private residence, and I am grateful that the present earl, the 21st Earl of Moray, allows me to see the Great Hall. At the front door I meet Grant, the ‘castle keeper’. In the Great Hall, a magnificent room dating from the 1400s and built to hold a thousand men rallying for battle, I am suitably awed. I can see why Isobel chose this setting in which to carry out (or fantasize about) her night revels. Grant graciously drives me around the grounds, shows me a nine-hundred-year-old tree, and when I learn that he is working on a novel too, we have fun talking about writing. For my last few days in Morayshire I move into Nairn to an Airbnb. Another serendipitous move because there I meet Morag, who catches my excitement about the Isobel story. Morag, a woman in her fifties with a thick mane of gray-blonde hair, could be a modern-day version of traditional folk healers like Isobel. She’s an energy therapist and evolution coach who writes essays on conscious living and swims in the sea every morning, even in winter. We fall into a marathon conversation. Finding the Downie Hill was one of my priorities on this trip. The Downie Hill was, according to Isobel, the place where the fairy queen lived. Isobel would go there to see the queen in her finery of ‘white and lemon linen’ and the elves in their workshop fashioning the elf arrows that could be shot from a thumbnail to kill people, and to dance with the fairies. According to my sources, the Downie Hill is one of a ring of fairy mounds in the area. Through searching on Google Earth and looking at the maps Andrew lent me, I locate a general area for the Downie Hill, but to my surprise, no one in the area knows about it. I talk to one woman named Downie, and she points me to the nearby Downie Woods, but she knows nothing about the hill. The path she indicates into the Downie Woods ends in an impasse of brambles and undergrowth. I do find ‘Macbeth’s Hillock’, a mound of a hill marked by a road sign, supposedly where the three witches brewed their bubbles and troubles and gave Macbeth his dire prediction. The farm family that owns the land has put up some little camping cabins shaped like witches’ hats. But the owner says she’s never heard of the Downie Hill. On the topographical map I see that Macbeth’s Hillock must also be one in the ring of fairy mounds and deduce that the Downie Hill must be nearby. I drive around the neighboring roads, and, all of a sudden, I spy, across a wide expanse of field and almost hidden behind a thicket of trees, an enormous mound. A cone-shaped hill thrusting up out of the flat land that I would have missed if the sun hadn’t been shining directly on it. I stop at the farmhouse across the road and knock on the door. A young man with a BBC accent tells me that that mound was an old fort. Apparently, these mounds once housed ‘dun forts’, strongholds more ancient than the seventeenth century, though in Isobel’s time they were called fairy mounds. When I tell Morag about my find, she’s as enthusiastic as I to visit the Downie Hill, and on this sunny July day we set out on our adventure in her little sports car with the top down. We find another path from a roadside lay-by, and begin to hike in. Now we can see the hill, but the terrain is uneven and covered with six-foot ferns. This, I learn, is bracken. I have reservations about pushing through, but Morag, a more intrepid hiker than I, says, “Of course we can forge through all of that,” and I follow her up the hill. At the top the bracken is as thick as below, but we find a small clearing and stand amidst the ferns. A sudden quiet descends. No bagpipes playing from the clouds, no wild men in kilts, and not even flickering fairies. The sun sparkles and the ferns shine green and radiant, and we are drawn inward, to a stillness in tune with this place. I look down. On the ground beside me is a crow feather. I pick it up, take it home, and tack it on the wall above my writing desk.